This week, in honor of the release of Star Trek Into Darkness, let's take a peek at J.J. Abrams' tribute to that other big sci-fi film franchise and an omen of his directorial future in this shot from his reboot of the Star Trek franchise. But on closer inspection, there's a familiar piece of space junk drifting by just above Sulu's head. Why, what could that be? It would appear that astromech droids are standard equipment in the Federation as well as the Rebel Alliance. 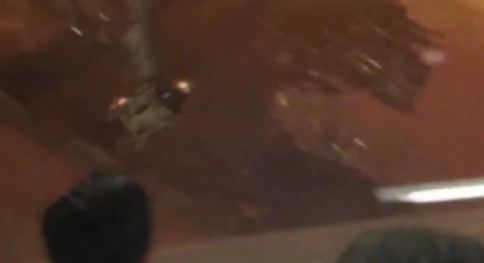 There goes R2-D2 in one of his various interstellar cameos, more of which we'll get to over time. 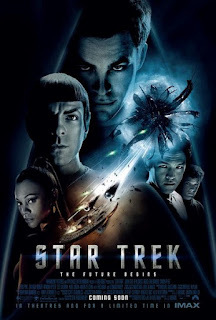 Abrams is an avowed fan of the Star Wars series, one of the big reasons he recently signed to direct Episode VII of the saga and it's pretty clear his affection for George Lucas' cinematic universe has influenced the adventurous tone he's brought to Star Trek, to the chagrin of some Trekkies (or Trekkers depending on your preference). I never would have noticed that! funny.